Pink shoes are the epitome of girly fashion. They may seem scary to some, but they're a fabulous way to spice up an otherwise neutral outfit. Wear them to work as a funky, understated accessory when everyone else looks like zombies in their black pumps, loafers, and flats. The good thing is, pink shoes are popular enough to be available in all styles and sizes. Black may be back for fall, but pink shoes can never be shoved to the back of the closet, no matter what the season. In a professional world, women often feel the need to act like men and leave their feminine side at home for fear of not being taken seriously. At heart, though, we all like to feel a bit girly, from the frilly push-up bras we wear under our stern suits to the time we spend curling our hair. Even housewives and stay-at-home moms sometimes ignore themselves in lieu of household duties and children's needs. Isn't it great that we have pink shoes to help us get in touch with our inner girly-girl? 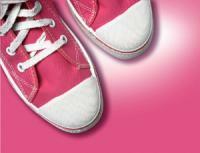 By wearing pink shoes, we get to express a bit of our feminine side without going over the top. They remind us that we can be smart and powerful, yet still look good and take chances with fashion. Pink shoes are any woman's answer to remembering who she is and how phenomenal it is to be a woman. They're not just a pair of shoes--they're a statement. 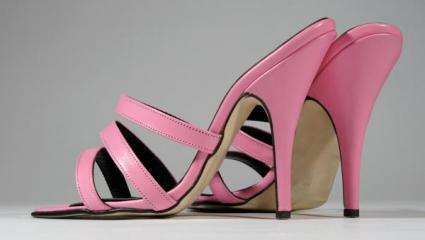 Depending on the style of the shoe, you can wear pink shoes with just about anything. Obviously, you'll have to be careful about what you pair them with as far as colors go, but be bold! Try some pink flip-flops with a blue jean mini skirt and black top for an easy, casual summer look. Wear pumps this shade with a pair of white pants and a coordinating top in pale aqua, yellow or even one with pink stripes. Got a pair of hot stiletto boots in magenta you're dying to wear but don't know how because they were an impulse buy? Show them off with a neutral toned pencil skirt and white shirt. The focus of the outfit will definitely be the boots, so you don't want to wear too much color in your clothing. Anne Klein Restina Platform Pumps are great for the office. Pair them with a soft gray suit and light pink cami for a pulled-together, professional look. The jewelry best for this outfit is classic and delicate. The Gel Quantum by Asics is the perfect pair for the sporty girl who loves pink. Wear them with your gym shorts, yoga pants or blue jeans for a laidback, feminine appeal. You'll probably want to save the jewelry for another day, unless you have a sentimental piece you never leave home without.